This course is tough. Detectives and analysts work their tails off to be in it and they love to problem solve. Equally important, they have all been through the ZetX 40 Hour Basic as a pre-requisite. Yes, you have to attend the 40 Hour Basic to take the ZetX Subject Matter Expert class. “But, I’ve been doing this stuff for years!” you say. For a while, we let pre-screened, “qualified” people in the class who hadn’t taken the Basic, and realized they couldn’t keep up, they slowed the class down and things they thought they knew didn’t live up to ZetX training standards. More importantly, they realized it pretty quickly, too. So, if you want to take the Call Detail Records Subject Matter Expert class, we would love to have you! Be prepared to work hard, network a-plenty, and have fun! Law enforcement needs well rounded geo-location experts, especially with call detail records. Until now, we have relied too heavily on the three letter bureaus to be experts for us. We believe every agency needs to be self-sufficient, with standardized processes of investigation. 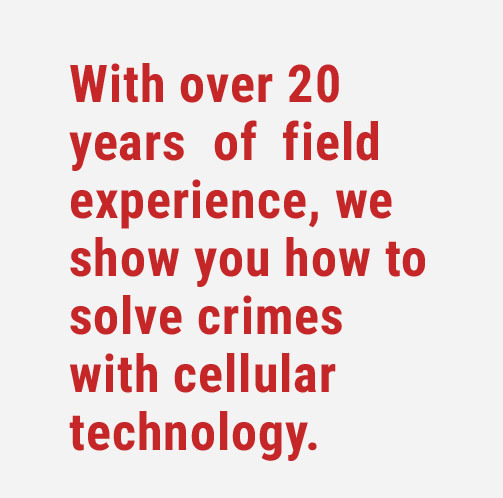 With cellular advances moving so quickly, and the masses of people who own cellular phones, every agency needs the ability to conduct their own cellular investigation without compromise. That means, no more sending out your records and waiting months for a sub-par analysis. Every agency has their own expert(s) when they finish our certification process. Goals! Expect to work individually and as a collective group. The class changes often to keep up with the newest and most advanced technology we see from every provider. Therefore, you may see one or several complex case studies with theoretical, scientific, and technological learning objectives. To put it another way, you’re going to smarten up in areas like cellular communication principles, radio frequency propagation, GPS data, attenuation and the application of scientific principles. With this in mind, cellular legal standards are stressed throughout the class in the hope every student conducts cellular investigations ethically and responsibly. Expect to make friends. If you’re not a people person, get over it. You will need, trust and want to be trusted by your classmates. These are some of the people who will peer review your work before you get on the stand to testify. Definitely bring a stack of business cards. A good attitude. Pack a laptop and charger. Bring your sense of humor. Make sure you have Google Earth Pro on your laptop. Have a good work story ready. Install the NEWEST version of Microsoft Excel. Whatever you do, DON’T bring your fun sponge! You have to complete three pass/fail assignments, in a 12 month period of time to certify as a call detail records subject matter expert. There is a deadline for each assignment and the schedule is given at the end of class (typically three months to complete each assignment). If and when you complete and pass each assignment on time, you will receive your SME Certification. Thereafter, you are expected to attend at least one 40 Hour Advanced class every year to maintain your certification. To demonstrate how adamant we are about continuing your education, we allow SME alumni to attend one FREE 40 Hour Advanced class per year. Get ready to bring your A-game! This training is legitimately rewarding and a cut above every other cell phone training out there. Train with us, Investigate with us, Trust us.